The winter months on central Tennessee can test all of us. The rain that never seems to end takes its toll on our moods and can also reveal damage to our roofs. When it comes to roofs, damage can go unseen until it reaches the interior of our homes. In this week’s blog, we will go over signs you can look out for to know you need roof repair. We are Tim Leeper Roofing and we offer roof services that include repair and replacement for both residential and commercial roofs. The most obvious sign, and the one you hope never happens to you, is water dripping down the walls, or dripping from a spot in the ceiling, making you use a pot to collect the water so that the water doesn’t also damage your floor or furniture. If this happens, it means that the damage has already gone pretty far and you need to call us right away so we can get out to your home or business and fix your roof as quickly as possible. Another sign that you need a roof, that shows itself on the inside of your home, is your utility bills. If you notice a spike in your heating or cooling bills and can’t explain it away through a heat wave, a polar vortex or something else, you may have wet insulation. When you have a small leak in your roof, moisture can get in and dampen your insulation. When insulation is wet, it doesn’t function well and your energy bills can spike. If you notice an energy consumption surge, give us a call and we’ll come out and do a thorough inspection, including in your attic and crawl spaces. Another sign that your may need a new roof is the calendar. Depending on the type of roof you have, it’s expiration date may be upon you. Asphalt roofs generally last between 20 and 25 years, after which the quality of protection they offer your home degrades significantly. If your roof is over 20 years old, it is a good idea to start the process of getting a new roof, before a leak tells you that need a new one, pronto! 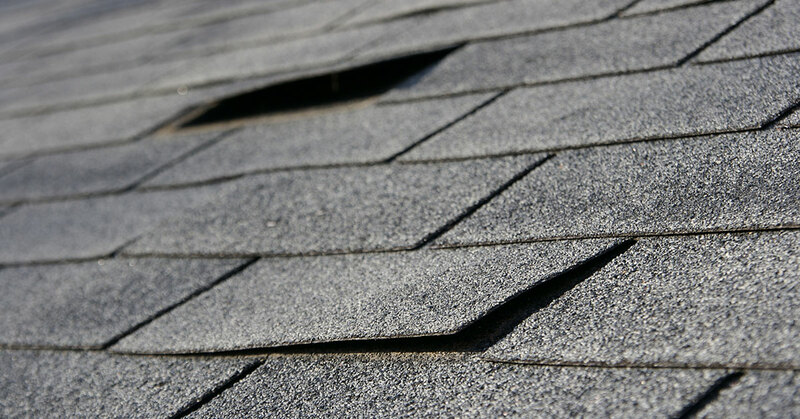 The condition of your shingles can also be an indicator that your roof is past its prime. If your shingles have lost many of their protective granules, the underlayer of the shingles has less protection from UV rays from sunlight and weather in its many forms. If your home has very recently undergone abuse from a storm and you notice lots of granules coming out of the downspout of your gutter system, you may be able to claim storm damage and have your insurance company pay for the repair or replacement of your roof. Call us out for an inspection to see if we can help with an insurance claim. Loose, or badly installed, flashing is also a sign that your roof is vulnerable. If you don’t yet have deeper, structural damage, missing flashing means that the proverbial dam has been breached and damage could be in your future If you have never had flashing damage, you may not even know what the flashing is, which makes it hard to identify potential trouble. Flashing is the metal trim that covers connecting points on your roof. You’ll see it around the base of your chimney, along the eaves, and along vertical parts of the home that meet part of the roof. It functions to keep water out of these otherwise vulnerable points. Missing flashing can lead to water trailing down through the interior of your home, even into the basement, so it should be taken seriously. If you notice missing flashing on your home, especially after a storm, call us out to avoid damage to your home. We know that next to having a leaky roof, the next most stressful thing can be paying for the repair of a leaky roof. But when you work with Tim Leeper Roofing, you can sit back and let us help you. We are experts at assisting with insurance claims. If you’ve recently had a storm in your area, and suspect you may have roof damage, call us out for a free inspection. Call us today if you suspect you need roof repair or roof replacement.